The controversial blood type diet has claimed many adherents since the 1996 publication of "Eat Right 4 Your Type: The Individualized Diet Solution to Staying Healthy, Living Longer and Achieving Your Ideal Weight." Authors Peter D'Adamo and Catherine Whitney advocated for people to base their diet and exercise regimen on their blood type. But this turns out to be problematic for committed vegetarians who are Type O and want to try the diet. In the world of the blood type diet, Type O is also known as "the hunter." Type Os need a lot of exercise and a lot of animal protein. Their stomachs contain extra stomach acid designed for digesting meat, poultry and fish. They are not well suited for digesting most grains and dairy products. Unstable thyroid functions often lead to Type Os gaining weight. Type Os gain weight primarily from gluten consumed in whole wheat products, which slows down metabolism. According to D'Adamo, some beans and legumes also contain lectins, or plant proteins, that interact poorly with Type O blood cells, leading to weight gain and a drop in energy. For optimal functioning and weight loss, Type Os must severely restrict their intake of grains. They should also avoid foods that disrupt thyroid hormone, including cruciferous vegetables such as cauliflower, cabbage and Brussels sprouts. While beans are a good source of protein for most vegetarians, Type Os' bodies are not well suited to processing beans, according to Dr. Michael Lam, a proponent of the blood type diet. He claims most legumes decrease the acidity in Type Os' muscles and inhibit their ability to metabolize nutrients. The most beneficial beans for type Os are azukis, adukes, pintos and black-eyed peas. Type Os should never eat kidney, copper or navy beans, nor any type of lentil. While eating wheat is not a good idea for Type Os, many other grains are better choices. 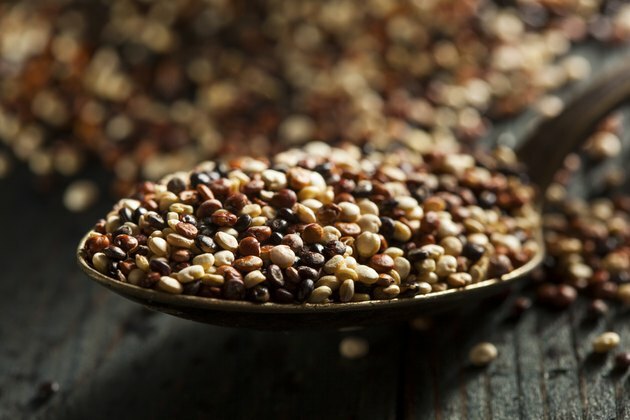 Type Os can enjoy barley, buckwheat, amaranth, kasha, rye, spelt and quinoa. Some of these grains are higher in protein than wheat. Quinoa, for example, contains 9 grams of protein per cup. Dairy is another source of protein upon which many vegetarians rely. But again, most dairy products are contraindicated for Type Os on the blood type diet. Butter, goat cheese, feta, farmer cheese and mozzarella are allowed. But yogurt, milk and ice cream are not. Dr. Lam suggests that Type Os of African ancestry eliminate dairy and eggs from their diets. Type Os can drink soymilk as a substitute for regular milk, thus providing a lean source of protein.